Sunday 27th March- A long day and a lot of miles! 9am Sunday morning (8am really because of the the clocks going forward!) saw my mate Paul knocking on my door ready to take a trip up to Norfolk to collect yellow. Unlike last weekend, when I was still in my bath robe and eating a bowl of ready brek when he arrived, this time I was ready and we set out for our first stop in Frating, in Essex. The guy doing the work on my car had bought one from another Club Triumph member (Well, two of them actually) so a deal was struck to deliver this one up to him and collect my one at the same time. We took a steady drive up to Wymondham while listening to a Slade-Greatest Hits CD, took this p*ss out of most thngs and moaned about what was left. We landed at our destination at around lunchtime and after swapping cars over and a short chat, we headed back. We decided not hang around as I had to get the car all the way back to mine yet and then return the borrowed trailer to Goldhanger in Essex. So, yellow is now safely stored away in the garage where MOT work will commence after the Historic Counties Rally next weekend. There's still some bodywork and paint work to do, but I still have to find replacement front doors, bonnet and bootlid yet. The BMW did it's maiden towing journey today and I have to say, Paul and I were very impressed with it. I can honestly say, it did just as well as the Pajero that I recently borrowed and we were hard pushed to tell the difference between the two. I was thinking of selling the Beemer and looking for a bigger vehicle to cope with towing duties, but after today, I think I'll stick with my fine piece of German engineering! March 26th. Bad day at the office! Saturday morning saw me bombing over to Canvey Island in the Rally car to get some paint made up for it. After it's recent panel work, it was time to paint it and get it looking presentable again. My good mate Paul kindly volunteered to spray it for me, so I picked him up on the way back and then listened to him moan about having to wear a seat harness rather than a normal seat belt! Lol! (I forgot he'd never been in the Rally car before!) I had to make him his usual ultra strong cup of tea back at mine while he masked up the car. The spraying started well, until it became evident that the colour wasn't an exact match. I had taken the swatches (colour matching charts) outside to the car at Canvey and got an exact match. So I can only assume that the guy mixing it didn't get quite right. It's bloody annoying because I only had this Saturday to do it before the Historic Counties Rally next Saturday. I'm praying for rain now at some point this week, so I can go out and get it splattered in mud, so the mis-match wont be so obvious! I was sent some more pics from Norfolk today. My baby is solid again and almost ready for MOT. This has just had any old paint thrown on it for now to stop the damp getting into the primer. 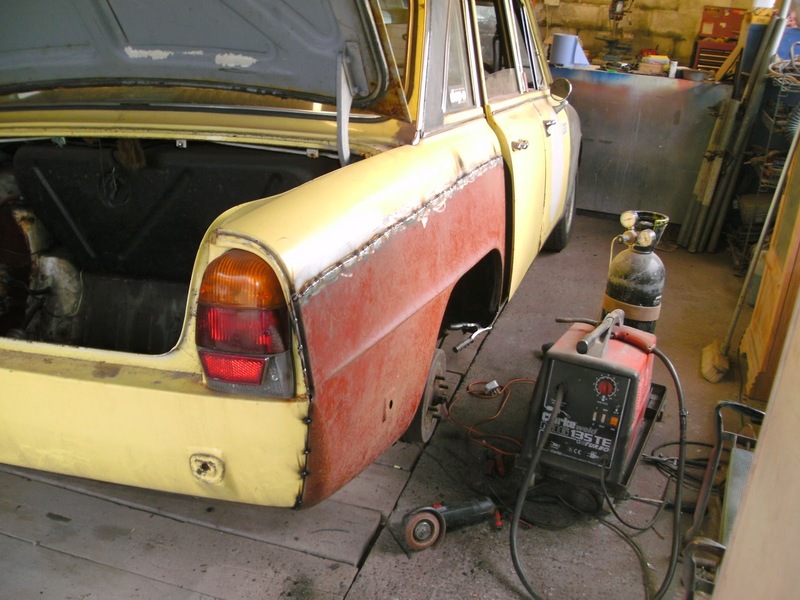 The search is now on for two front doors and a boot lid before a full respray is commissioned. March 23rd. Tow bar wiring and boredom! I like this car, but it really needs a specialist tune up. Once the HCR is out of the way, I intend to finally get the carburettors sorted out on it and make it a pleasure to drive again. Dave's starring role tonight was to once again wire up a tow bar for me. Not on a Triumph this time, (The estate already has one, and the two saloon's don't even have bumpers, let alone tow bars!) but on the BMW. I may need to collect 'Yellow' the Mk1 from Norfolk at the weekend and I'm not able to borrow the Pajero I borrowed last time, (Because it's up for sale!) so the 'beemer' will have to do the job. A tow bar was purchased last weekend, fitted Sunday morning and is now ready to do the job if needed. After two cups of tea, talking about the old days and grumping about the present days, the job was done. Dave even asked where the bin was to throw old bits of wire into!!!!! He normally just throws them all over the garage floor! I nearly fainted! Dave still wearing his 'day release prison uniform'! March 22nd. More pics from Norfolk. Can't be bothered to write anything tonight, so pics only. Replacement of rear wing. car should be ready by the end of the weekend! Yippee!!!!!!! March 20th-(Part 2) New sporty steering wheel! I got a bit bored Sunday evening, so I wandered out to the garage and decided to fit my new 'sporty' steering wheel. (Yet another ebay purchase!) The PI steering wheel I had on there was ok, but the band is very thin. This one has a wider band and feels far more positive. It didn't take long to fit either and with the obligatory white tape at the top ( to aid centralising) it looks the part. Sunday 20th March. More pics from Norfolk. Not much to report today other than more work progress from Norfolk. (He really is cracking on with my car!) The new offside front wing is now fitted and nearside rear wheel arch and sill is done. Saturday March 19th. Been to see my baby! I had to take a trip up to Norfolk today to deliver some more new panels up to where my car was and to discuss a few other problems that have been discovered. We started off by dropping off and picking up some bits and pieces at another mates house in Frating (Or Farting as I like to call it) in Essex and then carried on up to Wymondham in Norfolk. Lots of jobs to do now this week, so I'm going to be plenty busy! 16th March 2011. From Norfolk with Rust! Not much to report on the cars in my possesion at the moment, because I've been too damn lazy and de-motivated to do anything. Although the estate passed its MOT last Friday and I did fit a rally harness in the passenger side and a fire extinguiser holder in the rally car last Sunday, so not that lazy! Need to get some other jobs done though, as I'm competing in the Club Triumph Historic Counties Rally in a few weeks time. This is an overnight rally that starts in Lancashire 6pm Saturday evening and finshes in Suffolk 9.30am Sunday Morning, so all good fun! New posts on this to follow soon. Anyway, back to the storyline. 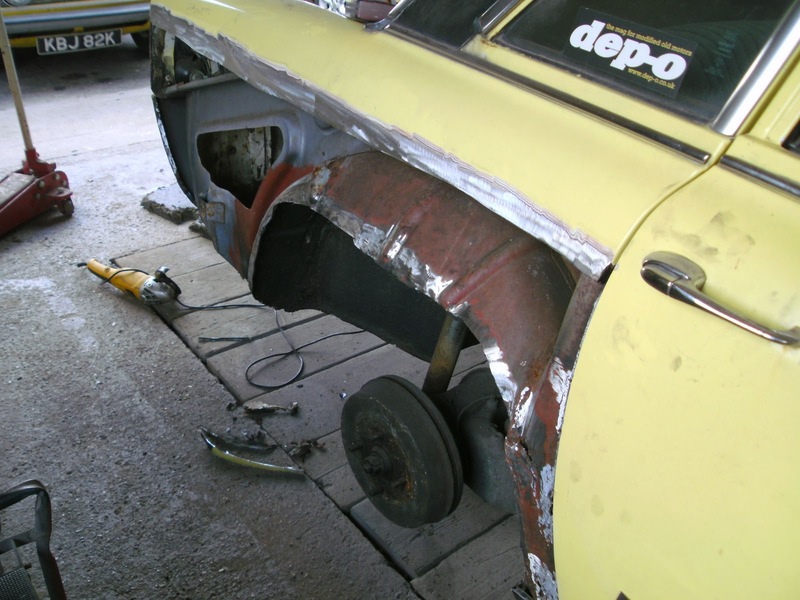 'Yellow' the Mk1 is progressing slowly but surely up in Norfolk. The drivers side wing was too far gone and had to be cut off and a new one is being fitted. More holes and rust were found under the wing (Not really surprised) so more work is needed there as well. The drivers side sill has been done, and I believe the passenger side sill was started on today. Saturday, I have to drive up to Norfolk to hand over the new rear wing I bought at Stoneleigh, so I'll take some more pics then. Work still to be done is the two rear arches, boot floor, and a few other bits and pieces. March 3rd & 4th - Rally car welding continued! With the floor pan now welded it was time to move onto the out rigger and sill. As you can see from the above pic, the sill was completely rotten at the back and the bottom of the front wing wasn't much better. As I am still a novice at welding, my mate from Cambridgeshire came down for a few days to give me a hand. I booked a couple of days off work to fit in with Pete's time off and we probably couldn't have picked a colder two days to work 10 hour days in the garage! Apart from the down side of running out of welding gas and being stung big time when it came to buying more, the two days was a success. The work was finally completed about 8pm on the Friday night and it was so cold Peter had to scrape the ice of his windscreen before he left for home! I carried on until 9.30pm and did some other pre-mot checks (The car was booked for MOT Saturday morning) and hoovering out all the grinding dust and paint dust! I decided to call it a day when I couldn't feel my hands or feet anymore! Anyway, later that morning I had an MOT pass certificate, so all jolly good! In the next thrilling instalment..........the Green estate goes for MOT as well!